Golden Grain Inc. is a family owned manufacturing business situated northeast of Winnipeg in the Keystone province of Manitoba. 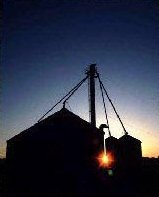 From Humble beginnings in the late 70's, it has grown to its present status, supplying grain bin accessories in western Canada and the northern U. S.
All production is completed in Beausejour, Manitoba with a U. S. warehouse in Fargo, North Dakota. Early years were spent assembling components manufactured by others. Research and development dictated the need for improved design creating higher airflow. Airfoil design is now standard with most components manufactured in-house. This allows better control of both quality and delivery times. Custom built products can be delivered with minimum delay and cost. Founder Bruce Barkman can be seen in the shop or making sales calls. His title is still sales manager.